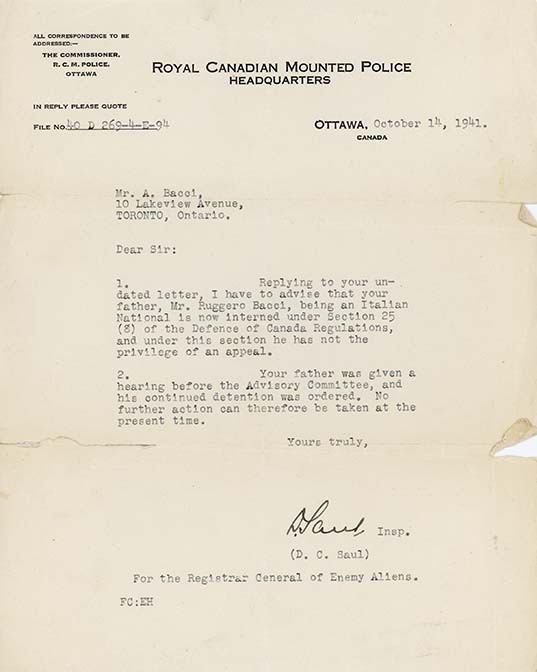 This typewritten letter was sent by D.C. Saul (Inspector, RCMP, Registrar General of Enemy Aliens), to Mr. A. Bacci, October 14, 1941. In this letter, the R.C.M.P. Inspector writes the son of internee Ruggero Bacci. Originally detained under Regulation 21 of the Defence of Canada Regulations, Bacci is now held under Regulation 25(8). As a result, he apparently does not have the "privilege of an appeal". For similar correspondence see LICEA2012.0002.0014, LICEA2012.0002.0073, and LICEA2012.0002.0078.